The word "process" might be overused in modern sports parlance -- thank the Philadelphia 76ers for that -- but few buy into the term more than Minor League Baseball players. Their work for the season officially begins in Spring Training camp in February or March, though some arrive even earlier. The season itself begins in April. Then over May, June, July, August and a little of September, they're expected to learn lessons every day in order to develop into more complete players by the arrival of autumn. They're expected to take their inevitable lumps, educate themselves on what went wrong, make the proper adjustments and get back to producing. Few Minor Leaguers have enjoyed more of a processional season in 2018 than No. 2 Mariners prospect Evan White. "I feel like it's been a whole process the whole season to get to this point," he said. "But it's really coming together here as the season comes to an end. You always want to finish strong, and I've made some changes that have worked out pretty good so far. But, really, it's just nice to be in the zone at the right time like this." Drafted out of the University of Kentucky with the No. 17 overall pick in the 2017 Draft, the right-handed-hitting, left-handed-throwing first baseman was known as a different specimen for his position. He was an above-average hitter, had a plus run tool and even showed Gold Glove potential at first. Overall, he had the type of athleticism that could play in the outfield, if he weren't so darn good at his natural position. The thing he lacked, according to most scouting reports, was a true power tool. He'd combined to hit just eight homers in his first two seasons with the Wildcats before breaking out with 10 as a junior in 2017. With a 6-foot-3, 205-pound frame, the potential for pop was there, but a flatter swing pointed toward average -- White was a .356 career hitter in the NCAA -- being his more impressive stat in the pros than homers or slugging percentage would be. After a taste with Class A Short Season Everett last year, White was a solid producer in the opening months of his first full season with Class A Advanced Modesto. He entered the second half with a .283/.348/.398 line, three homers and 26 RBIs through his first 56 games in the California League. That, along with his glovework, earned him a midseason All-Star spot, but in the hitter-friendly circuit, his offensive production didn't demand a ton of attention. Indeed, his first-half wRC+ was 99, which is not something to truly worry about but isn't ideal for a college first-rounder playing an offense-heavy position. Not content to be an average slugger three steps away from the Majors, White got to work in the middle of the season, studying video and trying to understand what he could do differently to boost all parts of his offensive performance. Nuts hitting coach Joe Thurston offered analytical help, but eventually it was White himself who caught that his hands had crept up in his stance from where they'd been in college. Along with guidance from Thurston, he worked on lowering them again to get them in the right place to maximize his promising bat speed. That work was his focus for much of the season's fourth month. "I think it was early or mid-July when I realized my hands were firing from too steep a position," he said. "I got to work on lowering them a little bit, and I finally found a spot that I'm comfortable with. There were some bumps as I worked through it, and it felt like it was a process for the whole month. But it finally got to a point with all the cage work and game work where I got my hands in the right position to fire. "The big thing was being on time and being in the zone longer. It's about getting a better bat path. It's not necessarily about launch angle or something like that. But the more I can keep my bat in the zone, the more of a chance I can give myself. Then, I have to attack the pitches I want to attack. There's no more hacking at a pitcher's pitch. The power's been there, but all of this is allowing me to use it more consistently." 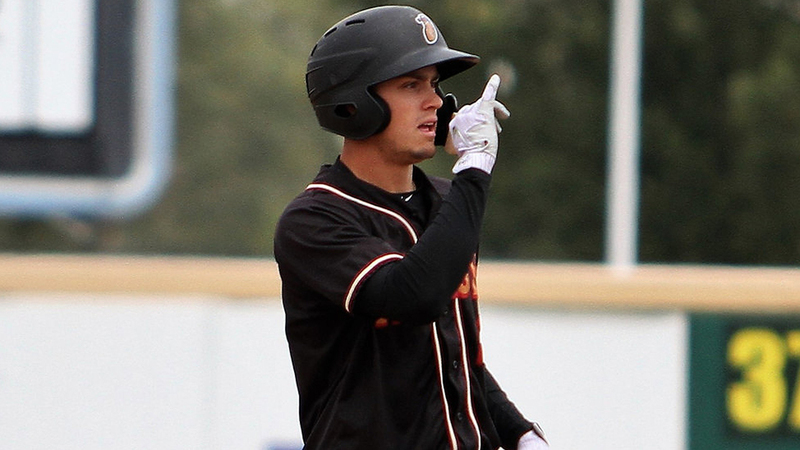 Pushing through the adjustment led to July being White's most difficult month of the 2018 season -- he hit .239/.308/.284 with four extra-base hits in 27 games. Worse yet, he didn't homer at all over 120 July plate appearances. August has been a different story, as the adjustments have turned into production. The Ohio native picked up hits in each of his first six games of this month, and on Aug. 9, he set a new season high with four hits. He went on to hit that mark in two other contests later in the month, on Aug. 16 and 21. He homered in back-to-back games on Aug. 7-8 -- the first time all season he'd done that -- and has added three more blasts since. Entering Tuesday, he had a .395/.478/.763 line with five homers, three triples, seven doubles and 23 RBIs through 20 August contests. His 1.217 OPS is third best among all Minor Leaguers in the month while his slugging percentage -- once his greatest statistical weakness -- ranks sixth. Once an average hitter in the Cal League, White has been well above that standard with a 225 wRC+ in August. Don't think the slugger is about to let this feeling go away, either. "I have a note section in my phone that I'm writing things down in about certain feels with my hands, my legs, my approach," he said. "In certain games or certain BPs, if I'm feeling it, I'm trying to get that note down as soon as possible. I try not to lose the memory of it because I'm going to need to reference it again in the future if anything gets off again." This tear has obviously boosted White's stock in a Mariners system in dire need of improving prospects. Kyle Lewis is the organization's only Top 100 Prospect at the moment, and the 2016 first-rounder isn't guaranteed to hold his place there for long; knee problems limited him early in 2018 and he's struggled at Double-A Arkansas in the second half. Wherever White plays in the coming weeks, there's a chance he'll do so as one of the most exciting present bats in the Minors. The former Wildcat has always had the potential to make a difference with his glove and arm, and with the improved bat path, he's also picking up more hits -- and more powerful hits, at that. Not that that's his worry. Improved power or not, White still won't enter his second offseason trying to become someone else's definition of the ideal first baseman. He's got his own process -- one that's producing extraordinary results of late. "Obviously, that's out there," White said of expectations of the traditional slugging first baseman. "But when it comes to power, I've always thought that's going to come, and I'm not going to focus on it and have it take away from the other parts of my game that I do really well. Those still need work too. If [power] is what it takes me to be a Major League first baseman, then so be it. Those offensive numbers will come, but I'm not going to focus on what others think I need to be, because I want to be an all-around player, too."